I’m a numbers guy – and the only things better than solar numbers are sports numbers. So I’m going to reprieve my usual solar analysis for some sports analysis. This year’s NFL season has a unique statistical race, as two quarterbacks (Drew Brees and Tom Brady) are on pace to break Dan Marino’s single-season passing record, and a third (Aaron Rodgers) is close. Both Brees and Brady are looking good for breaking Marino’s record. Through 13 games, they have 4,368 and 4,273 yards respectively. This puts them on pace for 5,376 and 5,259 yards each. They’re comfortably ahead of the record pace, by 5.7% for Brees and 3.4% for Brady. Another way to look at it: how many yards per game would they have to get in their final three games in order to just break Marino’s record? For Rodgers, it’s 320 yards for each of his remaining three games. For Brady, 270 yards per game. Drew Brees only needs 239 yards per game from here on out. So they look good now. But I was still wondering whether there would be any other outside factors coming down the home stretch. 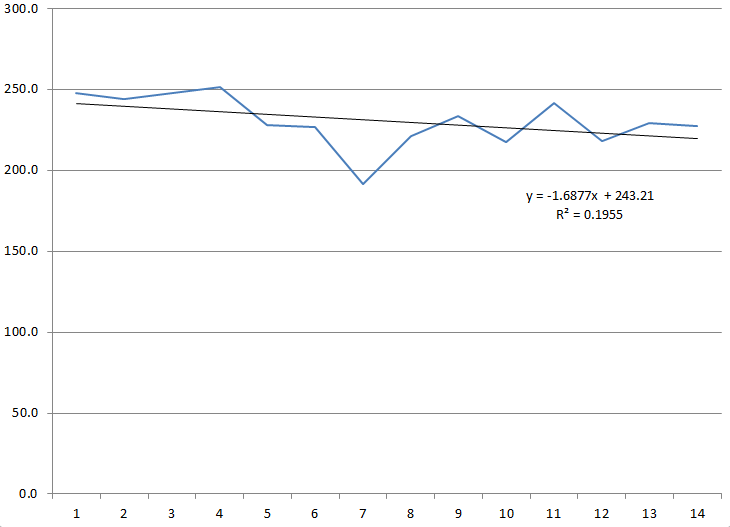 So I pulled some more data to test two more hypotheses. Hypothesis 1: are their remaining opponents going to be tougher to gain yards on? Could it be true that these quarterbacks got to beat up on easier competition earlier in the season? In fact, even if all else was equal, you would expect their past opponents to have given up more passing yards, just because they’ve already faced these record-setting passers. And, more importantly, are their remaining competition going to be tougher to gain yards on? Happily for Brady & Brees, the answer is no. Brady’s last three opponents (Den, Mia, and Buf) have given up, on average 236.7 passing yards per game. This is 6.5% more than their previous opponents’ average. Similarly, Brees’ three upcoming opponents have given up 2.9% more than his previous opponents. So both of these guys are going to be facing slightly easier opponents down the stretch of their potentially record-setting run. Unfortunately, Aaron Rodgers doesn’t have the same tailwind down the stretch. His last three opponents (KC, Chicago, and Detroit) have given up 5.7% fewer passing yards per game than his previous opponents. Hypothesis 2: Do passing yards fall over time? As the weather gets worse, it’s tougher for the skill-based passing plays to be effective. Over time, defensive secondaries might get better, particularly for zone defenses which require coordination and discipline. On the other hand, as the season goes on, the timing of quarterbacks and wideouts might improve, particularly for timing-focused plays like slants and outs. 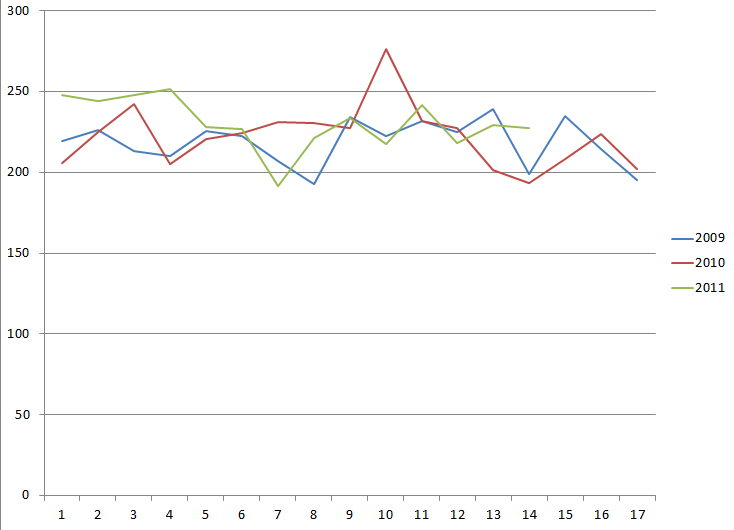 This year, through 14 weeks, there is a small downward trend in passing yards (see the chart below). On average, the teams pass for approximately 1.7 fewer yards each week. However, the R-squared value (.195) means that only about 20% of the weekly variation can be explained by the timing through the season. When looking at all three years, the downward trend doesn’t seem as significant. In fact, 2009 actually had a slightly positive change in passing yards over time (+0.8 yards per week), while 2010 was just a negative (0.8) passing yards per week. It seems like there isn’t much seasonality to passing yards at all. So all in all, it looks good for Brees and Brady. Both are strongly ahead of the record pace, both have easier competition down the stretch, and it doesn’t seem like the colder weather at the end of the season will significantly reduce passing yards. Now they just have to go out and play the games!